Our ISA Certified Arborists actually live and work in the mountain community so they understand many of the unique challenges that area residents must deal with including the threat of wildfire. 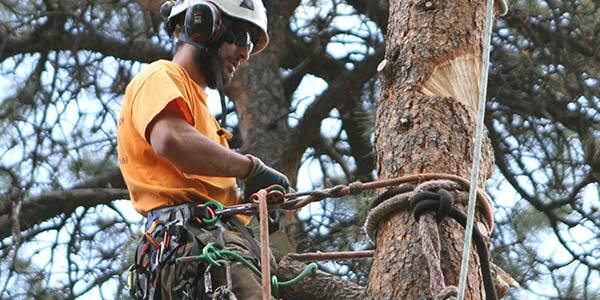 To help protect your home and property, Splintered Forest’s ISA Certified Arborists are available to provide homeowners in Conifer with a free, written estimate for any of our services. Whether you have a tree through your deck or need to complete fire mitigation for insurance purposes, Splintered Forest can help. At Splintered Forest, we believe that every property in the Conifer area has its own unique needs and one plan doesn’t fit all. That is why we work closely with homeowners to develop an individual mitigation plan that is tailored to their wants and needs, but also to assure that the property is properly mitigated based on Colorado State Forest Service (CSFS) guidelines. We can provide our free estimates one of two ways – homeowners can meet with one of our ISA Certified Arborists while they mark the property or with your permission we can stop by your property and leave high visibility tape on trees that need to either be removed (blue tape) or trimmed (pink tape). With either option, homeowners will receive an electronic estimate detailing the work to be completed.